Edward, Prince of Wales "The Black Prince"
Richard II (6 January 1367–14 February 1400) was the son of Edward, the Black Prince, Prince of Wales, and Joan of Kent, "The Fair Maid of Kent". He was born in Bordeaux, and became his father's successor when his elder brother died in infancy. His father died before him, so he became king in 1377. His uncle John of Gaunt, the Duke of Lancaster became regent until Richard II could rule. He was deposed by Henry of Bolingbroke (Henry IV), John of Gaunt's son with Blanche of Lancaster, taken prisoner and later died in captivity. Richard abdicated (resigned) in 1399. He was murdered later that year. 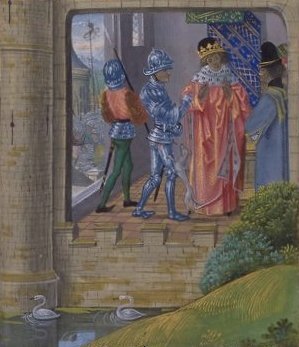 Fourteenth-century manuscript historiated initial showing Edward, the Black Prince kneeling before his father, Edward III. 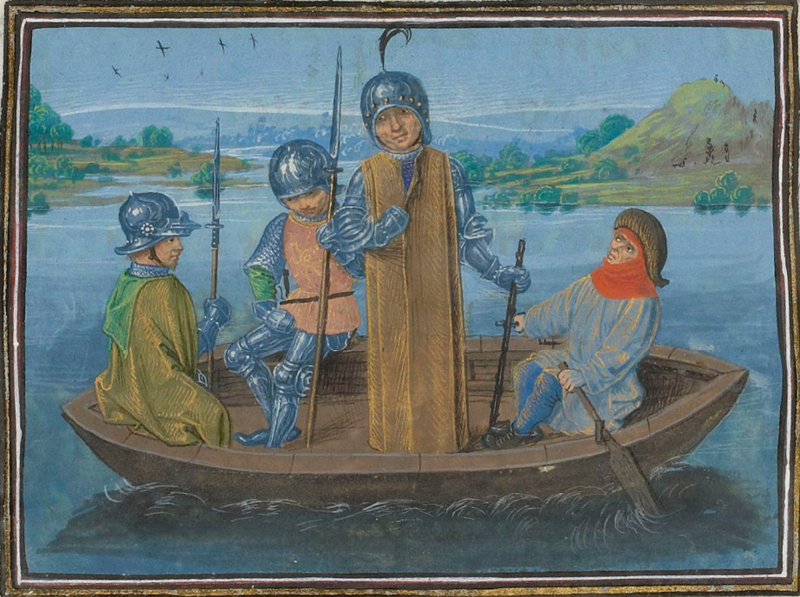 Robert de Vere fleeing Radcot Bridge (Froissart). Richard II of England Facts for Kids. Kiddle Encyclopedia. This page was last modified on 9 April 2019, at 10:16. Content is available under CC BY-SA 3.0 unless otherwise noted. Kiddle encyclopedia articles are based on selected content and facts from Wikipedia, rewritten for children. Powered by MediaWiki.